When I surveyed Slowflowers.com members for a recent Floral Insights and Industry Forecast, I asked respondents to rank their top business goals for the coming year. More than half of those participating in the survey indicated an interest in "using my farm for events and workshops." To me, this is notable because it aligns with another insight we've previously shared: Floral Tourism. Like wineries, ranches, orchards and other agriculture-based businesses, flower farms are getting into the agritourism business. And whether you schedule a once-a-year "customer open house" or an ongoing series of workshops for those interested in flower farming or floral design, there are all sorts of reasons to open up your front gate and welcome the public. Below are some inspiring ideas shared by flower farmers across North America. We asked contributors to explain their workshop goals (educational, promotional or financial), and share tips for others considering event production. During these shortest days of the year, when you may find yourself with a chunk of uninterrupted time to plan for the season ahead, here are inventive and creative ideas from our Slow Flowers Community. Perhaps their stories will help you decide whether an on-farm event or DIY class is right for your business. 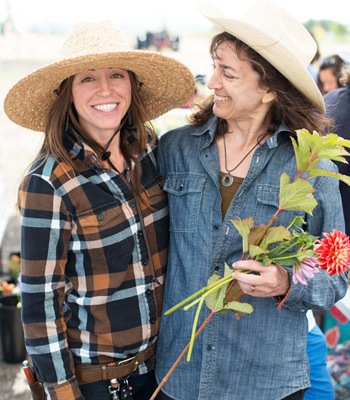 In California, Kate Rowe (L) of Aztec Dahlias & Maryann Nardo (R) of 7petals Floral Design team up to offer on-farm Design & Grow workshops. 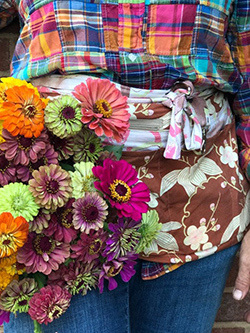 Flower farmer Kate Rowe of Aztec Dahlias in Petaluma, California, teamed up with Maryann Nardo of 7petals Floral Design to offer two "Design & Grow" workshops at her farm, held in August and September. 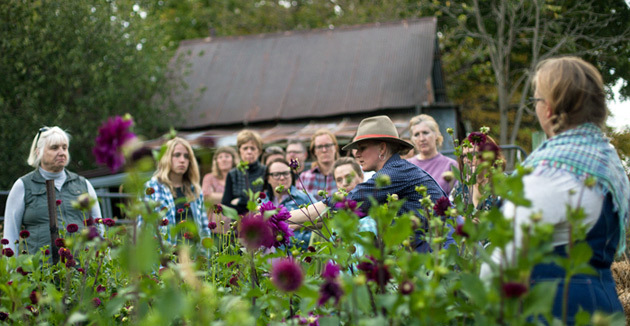 The women targeted dahlia lovers to combine floral design instruction with a field tour and discussion about growing techniques. Ten participants also learned how to design a mixed arrangement featuring dahlias. "Our focus was on the amazing and diverse dahlia genus and to provide an enjoyable experience — no matter what level of knowledge of the participants had," Maryann says. 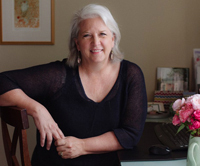 "In doing so, we promoted Aztec Dahlias and 7petals Design for future workshops and business." Against the backdrop of the farm's abundant blooming fields, the creative experience was immensely popular. In fact, says Kate, "after we scheduled the first workshop, there was a waiting list, so we added the second workshop." Kate advises holding the event in a designated space: "It keeps regular farm customers from wandering into the workshop." Other tips: Be ready at least 30 minutes early and watch the time — participants expect to start and end on time. Ask for any specific questions or expectations so you can address them during the session. Maryann credits good preparation for the success of "Design and Grow," explaining, "from the lesson plan, physical setup, and flow of the class, we thought about how much time each component required — and that helped make the day more fun." In Oregon, Beth & Jason Syphers host a Summer's Eve Floral Workshop at Crowley House — to "welcome summer in style." Crowley House, Beth and Jason Syphers' flower farm in Rickreal, Oregon, a charming design studio doubles as a workshop space throughout the year. On June 20, the couple hosted a "Summer's Eve Floral Workshop." "My idea was to welcome summer in style, and to hold an educational class on flowers, floral design, and growing from seed in your own backyard," Beth says. "I also talked about how to entertain guests for summer parties and use flowers from your own garden or locally-grown flowers to decorate." Beth likes to keep the number of students to 12 or fewer, which allows her to spend more time with each participant. "I make sure I'm well prepared at least one hour before guests arrive, so I'm not stressed out with last-minute details. And, I welcome them with a nice spread of small bites, local wine, antique table linens, a beautiful display of flowers, and music playing in the studio." Over the past few seasons, workshop students have returned again and again, becoming customers and friends of Crowley House, Beth says. "I always talk about the next few seasonal workshops coming up, and especially emphasize fall and winter ones when I know I'll be in need of extra income. We post photos of the workshops on social media to sustain the enthusiasm for upcoming events." 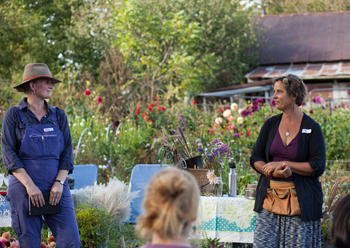 In Washington State, Carolyn Thompson of Willow & Mabel partners with Kelly Welk of CiderPress Lane to host a variety of educational workshops at her flower farm. Carolyn Thompson of Willow & Mabel Garden Co., a flower farm based in Poulsbo, Washington, has partnered with Kelly Welk of CiderPress Lane, a local event planner, to produce several workshops at her farm. In summer they hosted a "Sip & Clip" on a July afternoon. 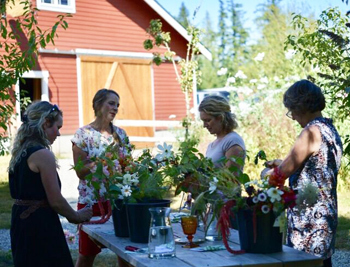 "Attendees came to the flower farm and watched me demonstrate how to put together a simple garden flower arrangement, together with learning how to care for flowers once they are cut," Carolyn says. "They then strolled the farm and cut whatever flowers they liked for their own arrangements." Twenty-three students worked at farm tables set up in the apple orchard, sipping drinks and eating small bites as part of the experience. Not only was the workshop successful, it also achieved several other goals, Carolyn says. "From a business perspective, we wanted to educate people about locally-grown, seasonal flowers. Also, it is another way to generate income and have more local people become aware of our business." 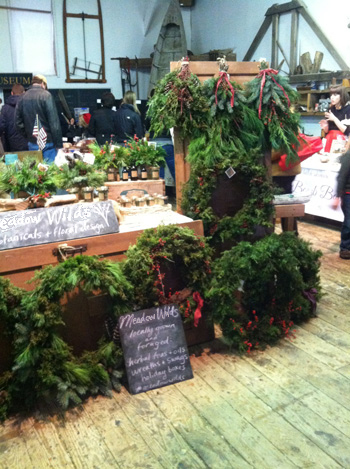 Carolyn and Kelly also hold holiday wreath-making workshops in December, priced at $85 per person. Says Carolyn: "Don't worry about your farm not being 'perfect.' I always think about the chaos that we have going on behind the scenes, the list of unfinished projects that I have going all the time, but to be honest, the visitor to the farm doesn't see it. Instead, they just love spending the afternoon with you amongst the beauty of flowers and greens." A sign welcomes the attendees to "From Field to Vase," a 2-part series of on-farm design & harvesting workshops held in Wisconsin. Last year, Erin Schneider of Hilltop Community Farm in La Valle, Wisconsin, partnered with Mary Jo Borchardt of Five Green Acres in Poynette, Wisconsin, to pilot a two-part series of flower design and harvesting workshops at their respective farms. Called From Field to Vase, the gatherings sought to convene "a welcoming, creative, and instructional space for aspiring and seasoned florists looking to hone their skills, share ideas, tour working flower farms, and meet others in an environment of luminous inspiration and camaraderie," Erin says. The women credit planning and budgeting, not to mention setting a clear workshop theme for the success of their series, held on July 23 and October 1, both from 4–7 pm. 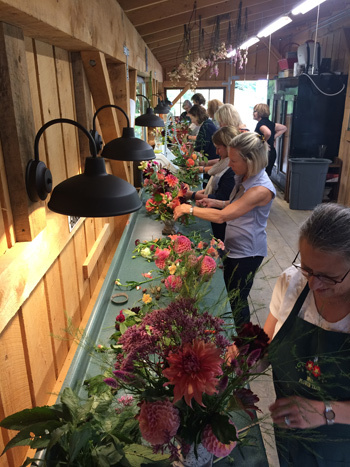 The July workshop highlighted market bouquets and flower swags, while the early October workshop was dahlia-centric. Overall, 26 students attended, an even mix of growers and florists. Students paid $48 to attend and were asked to bring their own vessel and tools. Organizers Erin Schneider (L), of Hilltop Community Farm in La Valle, & Mary Jo Borchardt (R), of Five Green Acres in Poynette. Announce events at least 2 months in advance. Offer online registration and payment through PayPal, which makes it easy for students and for accounting records. Give participants a chance to share what their interests are, where they are from, and why they decided to attend the workshop. Combine the farm tour with hands-on experience designing with flowers, and tie this into flower production lessons. Designate a note-taker for questions and topics you do not have time to address during the workshop. "Rather than give people reams of handouts and plant lists, we pooled resources and shared everything electronically — afterward," Erin says. For instruction, schedule a 15–20-minute demonstration, followed by 30–40 minutes for students to work on their own designs. Invite a professional photographer to document the event because as the host, you will not have time to do this. Be generous with information and resource sharing. Allow time for networking and socializing. Erin and Mary Jo invited students to stay for a potluck dinner following the workshop. "Those who stayed continued conversations, watched the sunsets on our farms, and relaxed in the beautiful evenings," Erin says. Sarah Nixon of urban flower farm, My Luscious Backyard in Toronto, Ontario, creates pop-up workshops in partnership with local businesses. Toronto flower farmer Sarah Nixon of My Luscious Backyard has an entirely urban operation, meaning she doesn't have a facility, per se, that is large enough to host workshops in her backyard or on her satellite grounds, which are residential gardens throughout her neighborhood. As an alternative, she creates pop-up workshops by partnering with businesses that share her local and sustainable ethos. 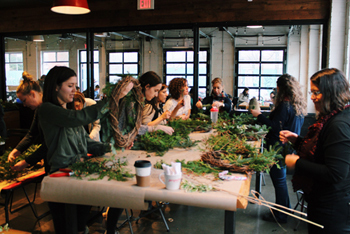 For her autumn and holiday wreath workshops, designed for 12 students, Sarah typically rents a private event room at a local café (or she trades wreaths for use of the space). "Since I don't have an appropriate space at my place, this works well for me. It's accessible to students because it's on the subway line, and the café has great coffee." During the growing season, Sarah is busy with her design work for weddings, as well as maintaining her subscription bouquet business. "But in the off-season, I find that wreath workshops are great for revenue," she notes. "They are also less expensive than floral design workshops, so the lower-priced class often attracts people new to me." Museum of Fine Arts Boston's floral designers attending Liz Krieg's Dahlia Workshop at Maple Flower Farm in Bethel, Vermont. Last September, Liz Krieg of Maple Flower Farm in Bethel, Vermont, hosted a Dahlia Workshop for the Museum of Fine Arts Boston's floral designers, treating 10 museum associates to an interactive discussion about flower farming and dahlia culture. She led the students on a walking tour of her fields and greenhouses and served a home-cooked meal. After lunch, the attendees were invited to design with just-picked and wild-foraged ingredients from Maple Flower Farm. "Many took their shears out into our fields and wood's edge to forage for themselves," Liz adds. "After a 4-hour visit with us they all left, happily well-fed, with pretty cachepot floral arrangements." 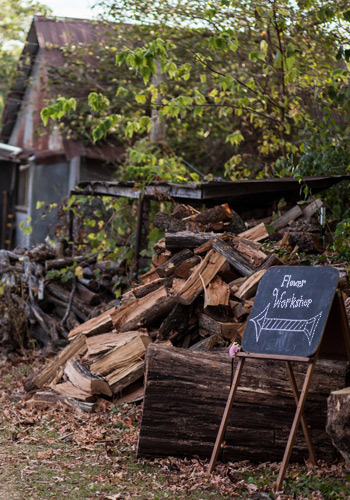 Adding workshops to the farm's offerings was an intentional decision, she explains. "We built a venue/workshop space last year specifically for educational and food-related events. We enjoy entertaining, and I personally have loved educating and lecturing about numerous horticultural topics over the years. We think there is a massive population of people who would be eager to be part of a farm workshop experience, especially if it includes hands-on learning, 'take-homes,' and — most important — good food!" Take a critical look at your potential workshop space and determine how many people it can comfortably serve. Think about the knowledge and experience you have that you can share with ease. Serving fresh food that you craft yourself is always an attractive asset because these are your guests and they want what you have to offer. Walk through all of your materials, food, and time, and assess the true value, in dollars, that you will need to charge per person to pay yourself and the farm business. Start with small workshops to begin with and refine your offerings as you gain experience. Be brave and give it a whirl! Rebeka Mindel of Meadow Wilds near New Paltz, New York, opens enrollment in her wreath workshops to her CSA customers first as a membership perk. Farmer–florist Rebekah Mindel of Meadow Wilds near New Paltz, New York, holds annual wreath-making workshops in early December. "My goal is for everyone to make their own wreath while tapping into their creativity," she explains. "The benefit of doing an on-farm workshop is that people are able to take home a wreath that is unique and not what they would find at a store, which makes it special and personal." To attract students, Rebekah suggests inviting CSA customers first as a perk of their membership, then announcing the workshop to the public. Other tips: "Pick an ideal window of time when folks are available and can relax. I like hosting on a Friday evening so participants can enjoy refreshments and wine. I build in extra time because the hands-on process can take longer, but that means everyone can relax in the party-like atmosphere." Cost control is her biggest challenge. "I recommend planning out your budget carefully. Keeping the materials budget in line is also important," she says. "I've learned to make sure I'm familiar with how much product I need for each student's wreath, which will help avoid ending up with waste." Keep in mind all of the costs, especially when hosting in the evening. She asks guests to bring food and drinks, and everyone brings something to share. "It requires trust that the refreshments will come together, and it takes the pressure off needing to feed a roomful of people on your own. It is a beautiful and rewarding evening, and I am looking forward to hosting this event again this holiday season." 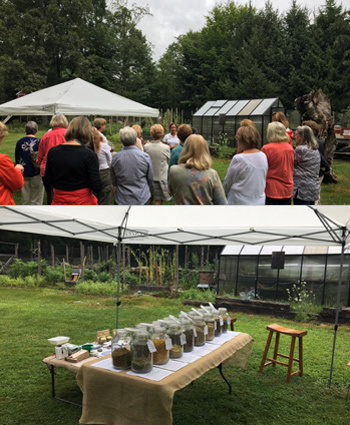 Farmer–florist Xenia D'Ambrosi invited garden club members to a workshop at Sweet Earth Co. in Pound Ridge, New York (top). Activities included creating custom herbal tea blends (bottom). 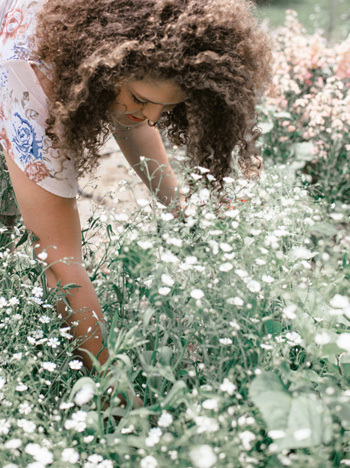 Photo credit: Sweet Earth Co.
At Sweet Earth Co., in Pound Ridge, NY, farmer–florist Xenia D'Ambrosi holds sustainable farm, herb-production and tea-making tours. When she hosted 25 members of her hometown garden club, she provided valuable information from personal experience. "First, I discussed and demonstrated how to do intensive planting, companion planting, and biodiverse practices that can be accomplished with an aesthetically-pleasing design. The second half of the workshop involved an interactive discussion on growing and using herbs." Attendees were able to create custom herbal tea blends to take home — a reminder to continue supporting Sweet Earth's products. "While I did receive a stipend for the workshop and generated on-farm sales during the event, my goal was primarily marketing," Xenia explains. "I wanted to put a face on my farm so customers would feel connected and compelled to want my products and services. I made certain to promote the many benefits of local flowers, my flower-and-herb CSA, as well as the two local retail markets that are selling my flowers and teas." On a practical note, Xenia believes organization and attention to details can help on-farm workshops succeed. Ample parking and seating, for example, need to be arranged in advance. "Beyond that, I make sure my team is attentive and able to answer questions. Sampling is also important, so I make sure attendees can get up close and handle the flowers, as well as taste the herbs. I provide freshly-brewed Sweet Earth Co. iced tea and homemade lavender sugar cookies, packaged with my label and contact information. Finally, I make sure to have items available for impulse purchases!" 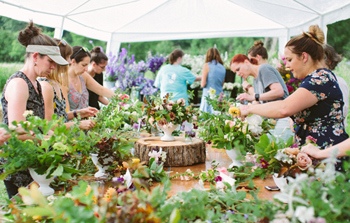 Andrea & Lou Gagnon host The Farmer Florist: Master Workshops at LynnVale Studios in Gainesville, Virginia. 2018 marked the third year Andrea and Lou Gagnon have hosted The Farmer Florist: Masters Workshop at LynnVale Studios, their farm in Gainesville, Virginia, outside Washington, DC. The two-day workshop takes place in August and attracts diverse individuals for an intensive focus on professional development. Andrea limits the number of attendees and sets the price at $1295, including materials, supplies, meals, and instruction from three professional artists and designers. She feels the pricing is competitive with other multiday workshops in the marketplace. "Our goals for the workshop are to educate and inspire new, existing, and transitioning growers, farmers, and designers, to help them cultivate a balanced and profitable business model," Andrea explains. Participants experience in-depth, hands-on design experience coupled with an intensive and introspective look into the philosophies and practical strategies of "growing big" as a farmer–florist. "Over many years of giving art workshops, my husband Lou has often shared his observation that people typically attend workshops for 3 reasons — information, affirmation, and recreation," Andrea says. "Our workshop is designed to be heavy on information, and has evolved from essentially a one-day experience to a more relaxed, two-day experience. This format allows for 'ahah' moments of insight." Participants in An Evening on the Flower Farm, a collaborative event hosted by Niki Irving of Flourish Flower Farm in Asheville, North Carolina. 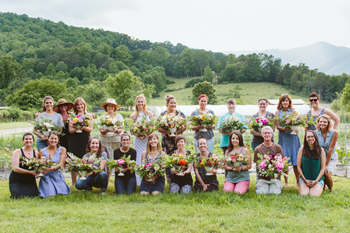 Several times a year Niki Irving, of Flourish Flower Farm in Asheville, North Carolina holds events she calls An Evening on the Flower Farm and Brunch on the Flower Farm, and invites customers in her community. She limits attendants to just 15, including flower enthusiasts and those interested in floral design and flower farming. "We want guests to experience a beautiful, relaxing time on the farm and to learn how to create a simple arrangement. To give them a taste of what goes on behind-the-scenes, because we are not typically open to the public, we lead an in-depth farm tour and talk about our growing practices and business model," Niki reports. "We also want the attendees to have the confidence after the workshop to buy flowers from a local farm or grocery store and create a beautiful arrangement at home." Her advice for other flower farmers? "Collaboration makes an event like this so much more special! We pull in flowers from several other local farms to highlight what they grow; a local bakery does the catering; we have a local calligrapher design the chalkboard signs, giving credit to everyone we collaborated with, and she even makes name cards for everyone." Guests of Flourish Flower Farm gather for a group shot with their creations. The inclusion of fellow flower farms in the area helps provide other perspectives on design and farming to the presentation, Niki adds. Think about the intangible benefits beyond financial ones, though. "I would not recommend hosting workshops because you think you will make a lot of money," she confides. "While it can be a great way to generate some extra farm revenue, there is a lot of overhead involved to make sure your guests are comfortable — so be prepared for those expenses." There have been positive outcomes from the events, ones that continue to draw attention to Flourish Flower Farm. Niki now has Sarah Collier's beautiful workshop photography for marketing her floral design services (seen here). "And due to demand, I've begun hosting private design sessions on the farm. These are basically mini-workshops for one to four people and include a farm tour, light snacks, and guests' choice of designing a bridal bouquet, a lush centerpiece, or floral jewelry. These have been one of the highlights of the season for me." Is your head spinning with ideas? Mine is! People are seeking authentic experiences that help them connect with nature, with flowers, with creativity and camaraderie with others. View your farm as a place to nurture those connections and you may be surprised by the response from customers new and old. And, while generating extra farm income is important, less tangible benefits such as building community and promoting your brand are equally worth the effort.